What is the Texas Citizen Bee? The Texas Citizen Bee is a statewide civic education program and competition. Students use an online guide and phone app to prepare for a two-part competition. Can I use the PDF of the Citizen Bee Study Guide from prior year’s competition to prepare for the competition? No, please destroy all copies of the old PDF guide as the content has changed significantly. What are the specifications of the written and oral portions of the Citizen Bee Tests? LANDMARK SUPREME COURT CASES/CIVIC VALUES AND SKILLS AND CURRENT EVENTS: For questions in the ORAL COMPETITION, students will not be required to give the name of a case (for example Texas vs. Johnson) but rather will be asked questions related to the content of the case. What grade levels are eligible to participate? Who can act as a student’s sponsor? Is the competition open to all types of schools? Yes, all public, private, home school, and parochial schools are welcome to take part. How do I register for a regional competition? Each region has a registration coordinator for the competition. Please click the link below to be redirected to the registration for competition page. Be sure to include the information requested when sending your email to the coordinator. What are the competition topics? What are the dates of the regional competitions? The competition date will be selected by the Regional Coordinator. The regional contests will run from February 25, 2019 till April 6, 2019. How many students can one teacher/sponsor register for the regional contest? Each teacher/sponsor can register a maximum of three students to the regional competition. What do I do if I have trouble registering my student? 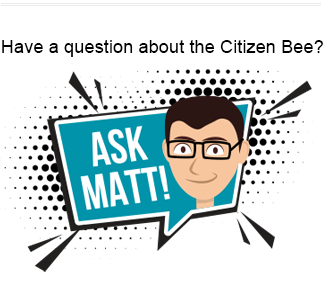 Please contact the State Citizen Bee Coordinator at jworst@cutx.org for assistance. What happens at a regional competition? Each regional competition will have both a written test and oral component. All participants compete on a multiple-choice test administered by the contest proctor. Questions for the test will cover all of the topics listed previously. Students have a total of thirty minutes to complete the exam. Can I compete this year if I have competed in prior years? What are the new rules for 2019? Students must listen carefully to the oral questions. If the moderator asks for a student to give the name of a person, they must give the full name as it is cited in the Texas Citizen Bee Study Guide (website, app, or the PDF copy) for the answer to be correct. The citations in the guide sometimes include middle names, initials of middle names, or surnames for clarity. LANDMARK SUPREME COURT CASES/CIVIC VALUES AND SKILLS AND CURRENT EVENTS: For questions in the ORAL COMPETITION, students will not be required to give the name of a case (for example Texas vs. Johnson) but rather will be asked questions related to the content of the case. Note: We have identified specific cases for the regional written and oral competition. Click here for details. How is the regional winner selected? A student’s written test score and his/her score in the oral round will be combined to give them their final score. The student with the top final score will advance to the state competition. A tie-breaking procedure will be utilized if there are tying scores. How long does the regional competition last? The regional competition lasts approximately 2 hours depending on the number of participants. No. Once a student has competed in a regional competition then they are ineligible to compete in any other regional competition. What should I study for the Current Events section of the competition? If I win my Regional Competition what’s next? Each regional winner will advance to the state competition in Austin. The state competition will be held at the Texas Law Center and the state capitol on Saturday, April 27, 2019. Travel expenses for the winning student, a parent/guardian, and the teacher/sponsor will be covered by the grant. Who funds the Texas Citizen Bee Competition? Law Focused Education, Inc. receives funding from the Hatton W. Sumners Foundation to administer the Texas Citizen Bee in Texas. The site is maintained by Law Focused Education, Inc. and the State Bar of Texas Law-Related Education Department. Who can I contact if I find a factual errors in the Texas Citizen Bee Study Guide? Challenges concerning the accuracy of any material in The Texas Citizen Bee Study Guide must be filed in writing with the State Bar of Texas, Law-Related Education Department by emailing Jan Miller at jmiller@texasbar.com by February 1st of the year of the competition.